Can't open PDF format files? Click on the link below and download the latestAdobe Reader. It is safe, secure and free. Honest. Dominican Sisters of the Roman Congregation (U.S. Province) elected new leadership at their provincial chapter in April. 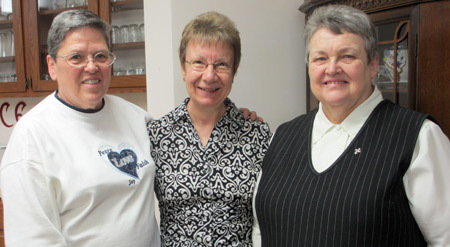 Sisters Mary Jude Chamberlain, councilor (at left in photo); Therese Demers, prioress (center); and Monique Belanger, councilor (right) will take office July 1. Sister Therese lives in Lewiston, Maine, and is presently a chaplain at Central Maine Medical Center. Sister Mary Jude lives in Staten Island, New York, where she teaches at St. Rita’s Catholic School. Sister Monique lives in Lewiston, Maine, and is a pastoral musician for Prince of Peace Parish. Visit DomLife’s Coming Events page for the latest schedule of summer retreats, programs, and educational opportunities. If you know of an event and would like to see it published, please send the information to editor@domlife.org. What is distinctive about Dominican higher education? The board of directors at Spirit Mountain Retreat, a non-denominational spirituality and meditation center in Idyllwild, California, is now accepting applications for the full-time position of executive director. The current executive director, Sister Esther Kennedy, OP (Adrian), will retire in June 2013. For more information and an application form, contact admin@spiritmountainretreat.org. Deadline to apply is July 15. Register now for the first annual Dominican Sisters Conference (DSC) Convocation Oct. 4–7 at the Westin Hotel in Wheeling, Illinois! Speakers Timothy Radcliffe, OP and Judi Neal will address the theme “Edge Walkers: Unfolding the Fertile Unknown.” The convocation will begin at 7 p.m. Thursday, Oct. 4, and will close Sunday, Oct. 7 at noon. To download registration materials (PDF 1.6 MB), click on the graphic or click here. The next Dominican Life | USA update will be published on Wednesday, May 16. Deadline for submission of articles/photos is Friday, May 11. Read the latest newsletter from the Dominican Lay Scholars Community, published on April 29, the Feast of St. Catherine of Siena. A recent article in the Akron, Ohio, Beacon Journal, “Traveling exhibit displays service of local nuns,” tells the story of the traveling exhibit “Progress and Promise: Sisters Serving Northeast Ohio.” The exhibit, which was created as part of the national exhibit “Women and Spirit: Catholic Sisters in America,” is on display through May 16 at St. Bernard-St. Mary Parish in Akron. As part of their ongoing centennial celebration, the Maryknoll Sisters of St. Dominic held a symposium, “Hearts on Fire” in April. The presentations given during that event are now available online. Coming up in May: Maryknoll on the Hill, May 16-17 in Washington, DC. Mass at Holy Redeemer Parish May 16; Visits to government offices and evening reception May 17. Centennial Liturgical Concert from 2 to 3:30 p.m. May 20 at Maryknoll Fathers and Brothers Chapel. View a complete schedule of Maryknoll centennial events at the link below. The Stella Maris Retreat Center on the Jersey Shore is offering a silent retreat, “Grounded Spirituality in the 21st Century,” July 6–12. Presenter is Sister Margaret Galiardi, OP (Amityville). To enlarge text on a PC, use the keyboard shortcut: Control + (push and hold the Control key and then push the + key). To reduce the size of text, do the same thing using the Control - (minus) keys.